OK, you have kids now and you’ll never travel lightly again. But, there are ways to make the trip easier-going. Before you pack up the family for a weekend getaway or your long-awaited vacation, check out these gotta’ have, road-tested gadgets and gear guaranteed to make your trip go smoother. Taking the kids to the beach? 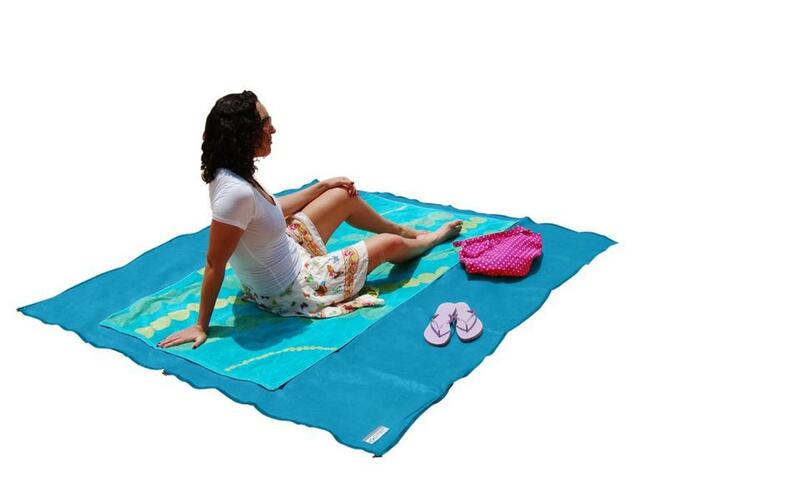 There’s no way you’ll keep sand off the blanket or off of you! A sand-less beach mat sounded too good to be true, but we gave it a try. Now, this one-way sift mat is a staple in our beach and camping gear. In fact, it stays in the trunk of our car, and is pulled out spring through fall at picnics, beaches, outdoor BBQs, and more. The ultra-thin weave technology, used by the military for years, allows sand and dirt particles to fall through without coming back up. Consider purchasing the sand-free tote bag ($29.99), with enough room to stuff the mat and a few other items. cgear-sandfree.com, three sizes from $59.99-$99.99. Your porta’ crib is fine for taking to Grandma’s house, but inconveniently heavy and bulky to lug on planes. This portable pop-up tent, with a cushioned bottom sleeping pad, is super lightweight and compact enough to stuff into your carry-on. It pops up quickly, and once you know the drill, collapses easily, too. Kids love it, and having their own little contained space makes them feel at home and more comfortable when traveling. It’s also a great thing to take to the beach, providing shade and insect-barrier screening. 800-553-5529, www.kidco.com, $119.99. Sometimes the smallest things can make all the difference. Take these multi-use snack bags. They’re lightweight, machine washable, dishwasher safe, and a feel-good purchase as an eco-friendly alternative to plastic bags. They come in two sizes and a variety of fun prints, and are perfect for storing snacks, small toys, wipes, crayons, and more. We also like the Clear Travel Bags ($12.95-$14.95), a package of three different sized bags that are TSA compliant. 480-481-3618, www.bumkins.com, $4.95-$6.95. If you’d like to help instill a love of travel in your children and deepen their understanding of cultures around the world, consider subscribing to the ingenious Little Passports program. The welcome package includes a miniature suitcase, passport, activities and a map of the world. Each month, your children will receive a country-specific package as they follow their pen pals Sam and Sofia around the world. The packages are well-done and creatively thought out. For example, in the Japan package, we received a letter from Sam and Sofia talking about their adventures (like eating sushi, making origami, and visiting Mt. Fuji and Tsukiji, the largest fish market in the world.) The package also contained a boarding pass to Japan with a secret access code to play games in the Boarding Zone area of the Little Passports’ website, a sushi eraser, stickers and a stamp to add to the map and passport, a postcard of Himeji Castle, instructions and papers for making origami, and an activity sheet for making a kite. Little Passports is available in three subscription options, Early Explorers for ages 3 to 5, World Edition for ages 6 to 10, and USA Edition for ages 7 to 12. www.little passports.com, Early Explorer $14.95 for 12 months or $17.95 per month, World Edition and USA Edition $11.95 for 12 months or $13.95 per month. This compact booster seat, 10 times smaller than traditional booster seats, promises to revolutionize family road travel. While traditional booster seats are bulky and heavy, making them inconvenient to pack for plane-rental car travel, the Grab-and-Go seat folds up to just 10 inches by five inches, and can easily fit in a tote or backpack. Instead of raising a child to meet the adult-sized seatbelt, this system adjusts the seat belt to fit the child, positioning it properly across the child’s chest and hips. Designed for ages 4 to 12 and available now for online preorders, it’s perfect for carpooling, car rentals, taxis, and extra vehicles. www.mifold.com, $49.